PFI is a failed Treasury policy. We can’t afford a Treasury ‘Solution’ argues Joel Benjamin. Three weeks before the 2016 Scottish Parliamentary Election and the race for Holyrood descended into something resembling a witch hunt as the Scottish Conservatives, SNP, Labour and Liberal Democrats all looked for someone to blame for the Scottish PFI schools fiasco. The Conservatives under John Major in 1991 created PFI, and New Labour under Blair and Brown enthusiastically expanded it from 1997, whilst governing in Scotland in coalition with the Liberal Democrats, who are therefore also to blame. The SNP created the Scottish Futures Trust, which delivered a modified version of PFI known as the Non-Profit Distributing Model (NPD), a PPP model 100% reliant on debt financing, which is still in use in Scotland today. In reality only a minor improvement on the PFI scam, replacing expensive equity finance, with more debt financing. But there is one fundamental problem with this revisionist version of PFI – it erases the role of key players, public and private, in establishing and enabling PFI in the UK, and abroad. Politicians did not simply wake up one morning and declare that banks should finance and own schools and hospitals, off-balance-sheet, via offshore tax havens, they were lobbied by City interests, prior to the implementation of PFI. What we should be talking about is the role of PwC, KPMG, RBS, Barclays, Bank of Scotland and other financial firms which stood to benefit from PFI, lobbying heavily for PFI’s initial creation and subsequent forced implementation by HM Treasury under New Labour. Banker Chris Elliott was seconded from Barclays to the Private Finance Panel under the chairmanship of Sir Alastair Morton. Established by finance minister Ken Clark in 1993, the panel comprised 15 senior representatives of the City, industry and the civil service to introduce private finance into all aspects of the public sector, including health, prisons and education, not just into large construction projects like motorways or bridges. Elliot returned from Treasury in 1995 to develop Barclays Infrastructure Fund (now called 3i) which invests in PFI, where investors are known to earn as much as 12 times the amount invested. Poacher, turned gamekeeper, turned poacher. The Private Finance Initiative (PFI) was jointly created by the UK Government (under John Major), in partnership with the Australian Government of Bob Hawke. Creating a global market in PFI/ PPP was always part of the City of London’s plan. In Australia, during my time working on transportation projects in the mid 2000’s the deals were known as Public Private Partnerships (PPP) – a different name, for the same rip-off infrastructure model. Whilst in Government in the 1990’s, the Conservatives adopted a “hands off” approach to PFI, in line with their free market principles. The PFI model was there to be used should the UK public sector so desire it. The Tories were not about to force the issue. Uptake of PFI infrastructure projects in the early 1990’s was painfully slow, partly because the sheer complexity of the contracts (PFI contracts are typically tens of thousands of pages in length) acted as a barrier for risk and cost averse public sector employees from engaging in PFI deals which they didn’t understand, and had struggled to access independent advice. When the Blair Government was elected in 1997, PFI became a key component of the ‘New’ Labour Government’s “third way” approach to delivering public services. Labour’s 1994 ‘Financing infrastructure investment’ report sent a clear signal to the City of London that Labour, previously hostile to the City, sought to develop a new relationship, with PFI infrastructure policy providing an olive branch to the big four bankers and accountants. Former US Federal Reserve Chairman Alan Greenspan wrote in his memoirs of meeting Gordon Brown and Tony Blair during this period, along with Ed Balls who had just left the Financial Times to be Brown’s financial advisor: “Brown espoused globalisation, and did not seem interested in reversing much of what Thatcher had changed in Britain. The fact he and Blair arrived on the door of a renowned defender of capitalism (namely me) solidified my impressions” (RBS. Shredded. pg 170). Labour’s Financing Infrastructure investment report made extensive use of the private sectors own reports – quoting Ernst and Young (now known as EY) and RBS in criticising the Government’s unwillingness to intervene in PFI to ensure its implementation. When Labour came to power in 1997, £30m had been spent on consultancy fees, but no PFI hospital contracts had been secured. The solution to the forced implementation of PFI by Government, so desired by the private sector, came via the Treasury Taskforce which was reconstituted as Partnerships UK and, surely ranks amongst the most morally corrupt, and deceptive actions a Government has taken against its own population. Acting under the direction of New Labour from 1997 the Treasury Taskforce was initially staffed with civil servants running the policy arm, and a projects arm staffed almost entirely by private sector practitioners from the City. In practice, the lines between policy and implementation became increasingly blurred. 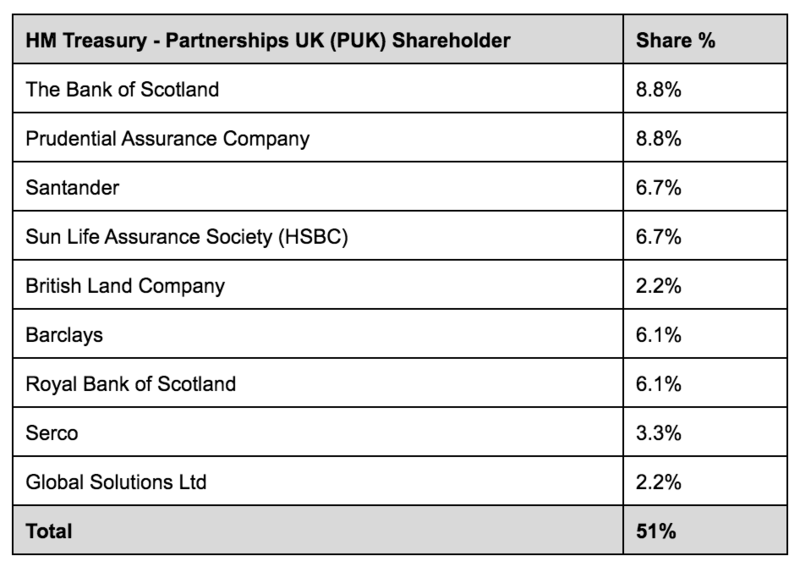 In 1999, the Treasury Taskforce was rebranded as Partnerships UK (PUK), 51% privatised – and sold off to a selection of major City firms including RBS, HSBC and Barclays for £45m. 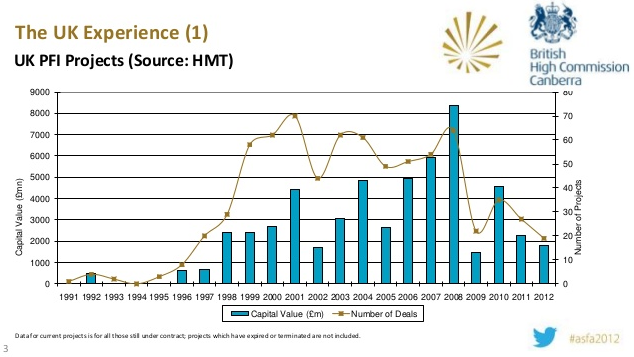 The following chart, via The British High Commission in Canberra circa 2012, illustrates when PFI projects were signed, showing the impact of the introduction of PUK on the PFI deals signed and the capital value of PFI projects. Figures available from 1999 from the House of Commons health committee show the net results: 22 Hospital projects worth over £10m each, 18 of which were funded through PFI. 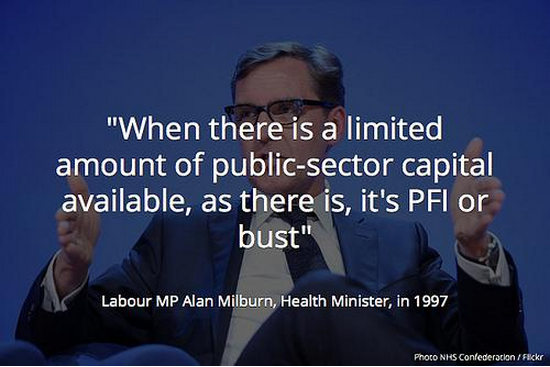 In 2008 when the UK banking sector crashed and £1.5 trillion was injected into the banking system, we learned public sector capital was not as ‘limited’ as Alan Milburn had suggested. All of the companies with stakes in PUK stood to benefit financially from its implementation, and the many of these companies had staff on secondment working within the PUK, which expanded into Partnerships For Health, and Partnerships for Schools commercial units.PUK derived its income from advisory fees paid by public authorities and the Treasury for financial & professional advice relating to the implementation of PFI projects. Public authorities thought they were paying for “independent” advice from Government (i.e. advice in the public best interest), however the Treasury PUK unit, having invited private sector profiteers into the heart of Government was providing nothing of the sort. “If there was a revolving door of advisors in Government moving on to advising public sector clients as consultants, then that demands full transparency. We cannot have a cottage industry of people profiting from giving bad policy advice in Government pushing the same ideas to “help” other decision makers make the same mistakes in the public sector at the expense of other sensible financing solutions”. “Government departments urgently need to bring forward the release of documents in the national archives regarding policy development around PFI and PFI credits. The consequences of the decisions taken then are being felt now in local authorities and NHS bodies who are really struggling with financial sustainability. Who were the key individuals worked at PUK? The present head of Infrastructure UK – International Division, James Ballingall is a lawyer formerly with Addleshaw Goddard, before joining PUK in 2003 where he remained as Head of Legal until 2010, spending 3 years within Treasury. Ballingall’s linkedin profile boasts of his work standardising PFI contracts for at least 300 PFI deals across England. James Stewart was the founding PUK CEO, and CEO of its successor – Infrastructure UK, set up by George Osborne. 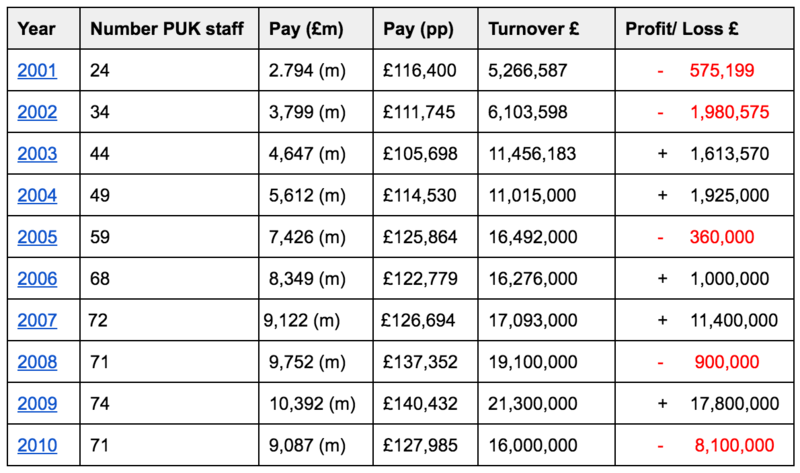 James Stewart received total pay packet of £431,000 for his work with PUK in 2008/09. Prior to PUK, Stewart worked at Societie General and has since moved to KPMG where he is the Chairman of Global Infrastructure. 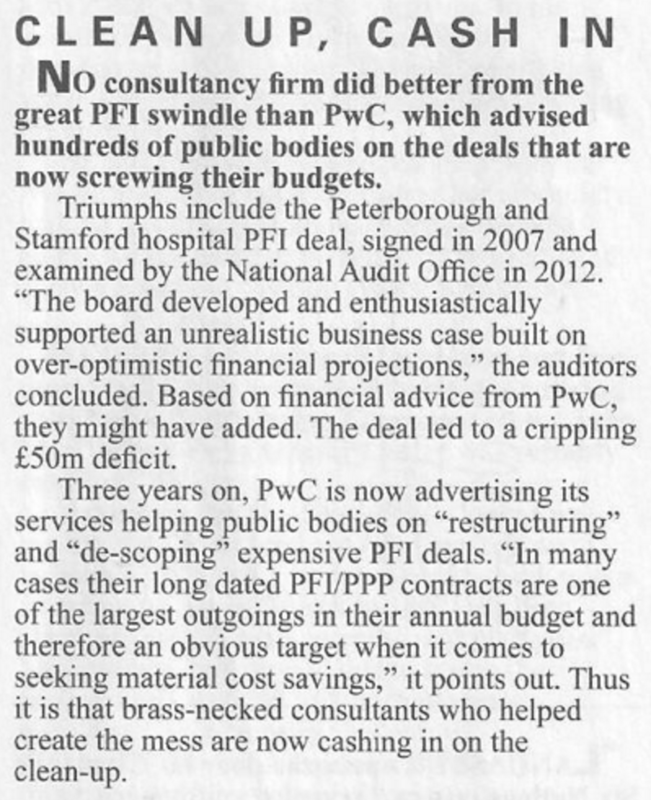 To date, the accountants, consultants and advisers at the heart of the PFI gravy train have not suffered any professional or reputational consequences for their one-eyed promotion of PFI, and there is zero public accountability for failures. The fact that two decades on from the start of the private finance experiment, PFI has brought dozens of NHS Hospitals to the brink of bankruptcy should now give politicians pause for reflection. As PFI expert Dexter Whitfield states in “Fingers in the PFI” the time should be ripe to abandon this flawed model, but instead PFI is being rebranded in the UK and exported abroad, with bankrupt countries like Greece copying the British PFI schools model which failed in Edinburgh. The Scottish Futures Trust has delivered the Non Profit Distributing Model, while George Osborne, who promised to end PFI whilst in opposition gives us PF2, which expands the equity stake in PFI, actually driving up project costs in exchange for a public stake. Treasury accountants are deceiving themselves. The Bank of England’s bailout of RBS shows us that there is no shortage of money, all we need is the political will to direct low interest capital from the Bank of England to infrastructure projects where it is needed, instead of propping up ponzi schemes in the banking and buy-to-let mortgage sectors. It’s time to call an end to the madness of PFI, and return to traditional public financing of infrastructure. But I do not believe that “Treasury accountants are deceiving themselves”. I believe that they know exactly what they are doing — attempting (largely successfully) to deceive the public who have to foot the bill for their transfer of wealth from the wealth creators (workers) to the wealth accumulators (idle rich, usurers and rentiers). The private financial institutions borrow money cheaply from the public via the central banks (e.g. Bank of England) and use that money to extract high rates of interest from the same same public via PFI schemes (and private loans to the working population). Before the advance of the Monetarists, and their deceit accounting rules, public works were financed by relatively cheap borrowing by the commissioning public bodies. The robbing of the public purse has been carried out by the expedient (sleight) of moving monies from one column to another in the Treasury ledgers, which for the most part are kept secret from the nation. Even as Brown was weaving his smoke-and-mirrors magic there were a few voices pointing out that interest rates were low enough to make traditional public borrowing much better value. But of course that wouldn’t have pleased their pals in the City. Today public authorities have been saddled with decades of unaffordable PFI debt repayments by their consultants, like PwC, Deloitte and KPMG who advised the public bodies to enter the contracts as “value for money” deals and negotiated the terms of the PFI contracts. Two decades on from the start of the private finance experiment, PFI has brought dozens of NHS Hospitals to the brink of bankruptcy. Ironically these same consultancy companies are now positioning themselves to earn even more fees to renegotiate the PFI contracts to ensure a better deal for the aggrieved taxpayers. The Bank of England’s bailout of RBS shows us that there is no shortage of money, all we need is the political will to direct low interest capital from the Bank of England to infrastructure projects where it is needed, instead of propping up schemes in the banking and buy-to-let mortgage sectors.